Orecchiette originates in the sunny southern province of Puglia, Italy, where the weather is warm and the crops plentiful. This pasta’s round, concave shape led to its name, which means “little ears” in Italian. The ridged exterior and cup-like interior captures chunky sauces and scoops up small vegetables, making orecchiette perfect to serve with sautés—sautés that begin, of course, with extra virgin olive oil, of which Puglia is the largest producer of in Italy. 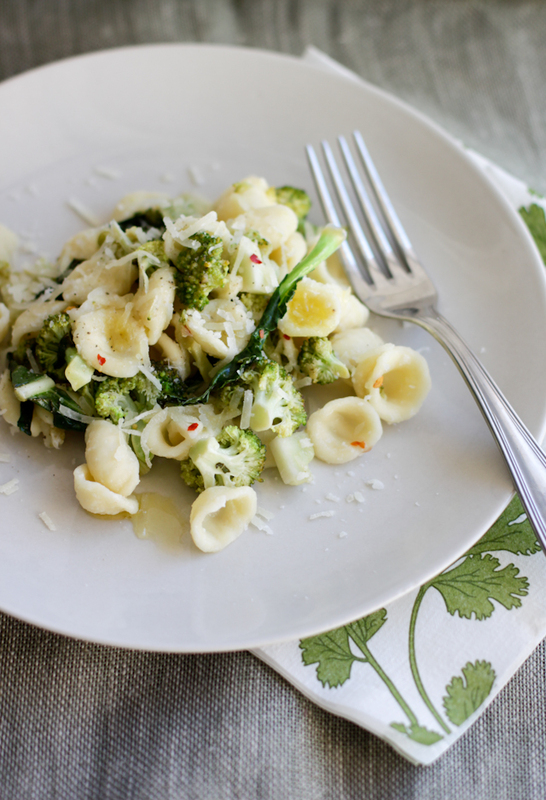 This is a simple dish from Puglia in Southern Italy, traditionally always prepared with orecchiette and broccoli rabe. We prepared this dish using the more commonly found vegetable, broccoli. When buying broccoli, choose vegetables that have a uniform green color with no major brown or yellowing spots. The broccoli stem should feel firm and the crown should be tight and springy; soft stems or limp florets are a sign of old broccoli. Store broccoli in the crisper drawer in the fridge until you’re ready to use it. Broccoli should keep fairly well for at least a week. Orecchiette also makes a nice soupy pasta when cooked in the same water with potatoes and a big handful of arugula, and garnished with garlic and chili in olive oil. When you yell “Dinner!” your family and friends will be all ears. To blanch the broccoli: Prepare a bowl of ice water and have it next to the stove. Bring a large pot of water to a rapid boil. Add a heaping teaspoon of salt. Add the broccoli florets and cook until crisp-tender, 1 to 1 1/2 minutes. Remove with a slotted spoon and plunge immediately in the ice water.If you would like softer vegetables, cook for an additional 30 secondss. Saute the garlic in oil in a heavy medium saucepan over medium-high heat, stirring occasionally, until golden, about 1 minute. Add broccoli and a little water and cook, stirring occasionally, until the broccoli is bright green and soft, but still a little crunchy, 8 to 10 minutes. Add the red pepper flakes and season with salt and pepper to taste and a sprinkle of cheese. Stirring and cook until cheese is melted. Add a squeeze of lemon juice and set it aside until the pasta is ready. Meanwhile, cook the orecchiette in a pasta pot of boiling salted water (2 tablespoon salt for 6 quarts water) until al dente. Reserve 1 cup cooking water, then drain pasta. Add the pasta and 2-3 tablespoons of the reserved cooking water to the saucepan with the broccoli and toss until combined then serve immediately with a handful of grated cheese and a drizzle of olive oil over the top. Pecorino cheese can be substituted for the Parmigiano-Reggiano, if desired. If fresh broccoli is not at hand, frozen broccoli that has been thawed and drained can be used in this dish. A 10 ounce bag will do.